If you are on the Internet a lot, chances are you have a lot of accounts to remember. How do you remember them? Do you keep them in your head, or do you write them down? Some people opt to write them down because they can’t remember them, but others say writing them down is bad because other people can find it. 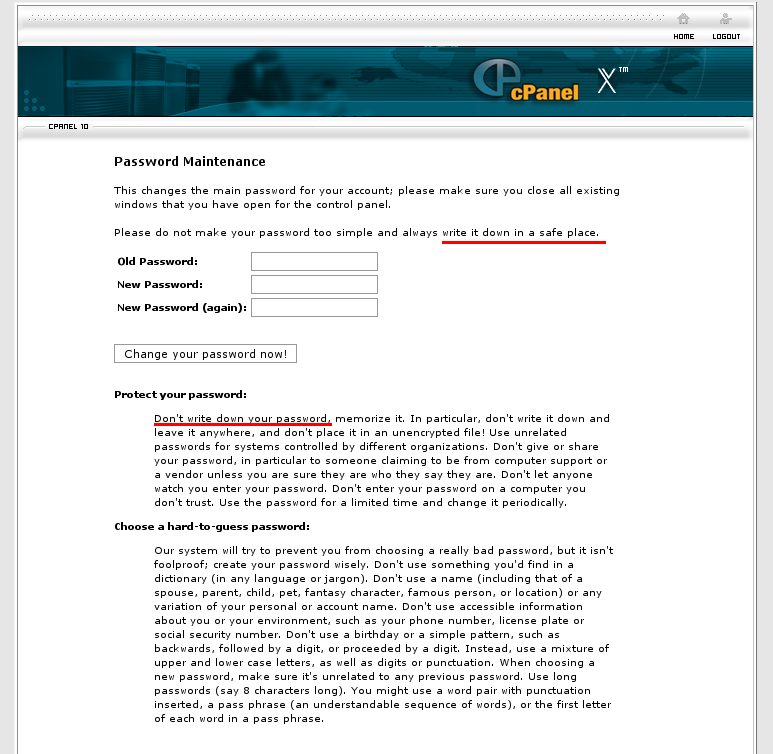 Well, cPanel can’t make up their mind because they contradict themselves right on the set password page. To reproduce that screen, all you have to do is log into your cPanel account, and click on the change password link. As of 11.8.0, it has that little contradiction. In my humble opinion, you shouldn’t write your passwords down. If you have to store them in something, use an encrypted password storing program. This entry was posted on Friday, August 10th, 2007 at 12:44 pm	and is filed under Internet. You can follow any responses to this entry through the RSS 2.0 feed. You can leave a response, or trackback from your own site. Nice catch. I used CPanel for a while and thought it was great, them I put plesk on one of my servers and I’m never using CPanel again. Why not? I tend to think that storing them on your computer, even if encrypted, would be riskier because the people who can hack into your computer are the type able to steal the passwords and decrypt them. If a robber breaks into your office, he’s not the type of person to steal passwords. He probably is going to just go after the most valuable thing he finds, most likely not the sticky note hidden in a drawer somewhere. I do the stupid thing and use the same 5 sets of passwords for everything. The master password for my encryption program is the largest one of all, and I’m pretty confident that it would take quite some time to crack. Plus, a robber may very well be looking for passwords written down in my office as identity theft is on the rise. I’ll admit I use a few passwords for most stuff as well.